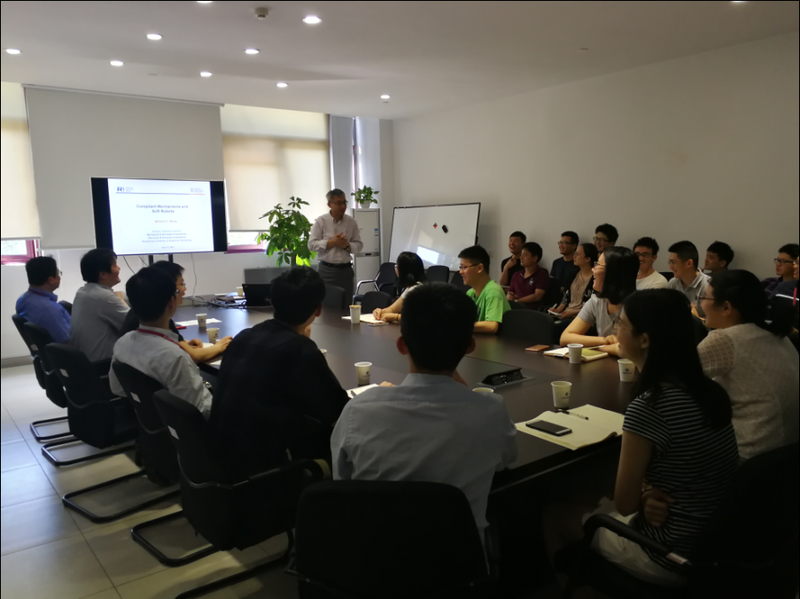 On May 18, 2017, Dr. Michael Yu Wang was invited by the director of Institute of Advanced Manufacturing Technology —Professor Guilin Yang to give an academic report in Ningbo Institute of Industrial Technology, CAS. Dr. Michael Yu Wang gave us a speech named “From Compliant Mechanisms to Soft Robots”. It is well known that compliant mechanisms provide kinematic solutions for transferring or transforming motion or force in a mechatronic system. Rather than relying on sliding or rolling motion as in traditional mechanics, compliant mechanisms produce their mobility based on the deflection of flexible members. This enables the integration of multiple functions into simple topologies, by embedding sensors and actuators to build fully functional and distributed devices capable of complex tasks. Further, the simple topologies in structural, mechanical, and electronic integration could lend themselves to advanced manufacturing techniques such as 3D printing with materials specialized in electro-mechanical sensing and actuation in addition to structural support, such as electroactive polymers and nanoparticle composites. Compliant mechanisms show promise for developing soft robots in addressing many pressing needs such as next generation medical implants and biomimetic medical devices. Now Dr. Michael Yu Wang describes an overview of a class of such compliant mechatronic systems and methods for their design and fabrication. He focuses on a computation method for designing compliant mechanisms with distributed compliance and/or made of multiple materials. Dr. Michael Yu Wang also presents an overview of exploratory solutions to modelling of soft continuum, hyper-elastic simulation for soft robots, distributed control of soft actuators (polymers or fluids), strategies for soft manipulation and locomotion, and rapid prototyping and fabrication of elastic robots. We all learn a lot about soft robots from this speech. Michael Yu Wang is a Professor and the Founding Director of HKUST Robotics Institute. He received his Ph.D. degree from Carnegie Mellon University (1989). Before joining HKUST in 2015, he served on the engineering faculty at University of Maryland, Chinese University of Hong Kong, and National University of Singapore.